In less than one year, we’ve been able to penetrate the mortgage industry by creating a brand new website, with a brand new domain and managed to get it ranked on page one for many keywords. We launched the site in October of 2015 and now it’s generating leads from keywords that are over $50 per click if you try running an Adwords campaign. We used nothing but white hat techniques that would never be penalized by a search engine because the tactics we use help search engines provide users with exactly what they’re looking for. 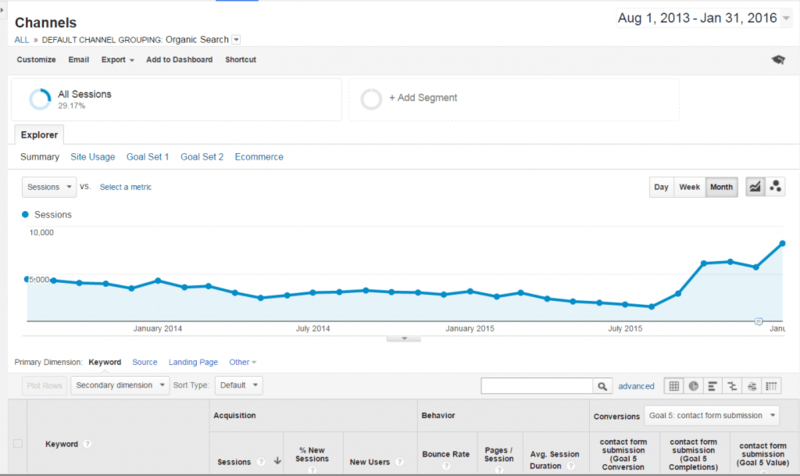 When you do SEO the right way, you can get great results like our client did. Call us for a free consultation and we’ll be happy to share more details on the Shop Reverse Mortgages case study and several others! If you look at the graph below, you’ll notice something right away about the next case study we’re moving on to. The traffic was steadily going down from August of 2013 which was because this client was working with an SEO company that had no idea what they were doing. They created thousands of toxic back links to this website and caused it to lose about 70% of it’s organic traffic. 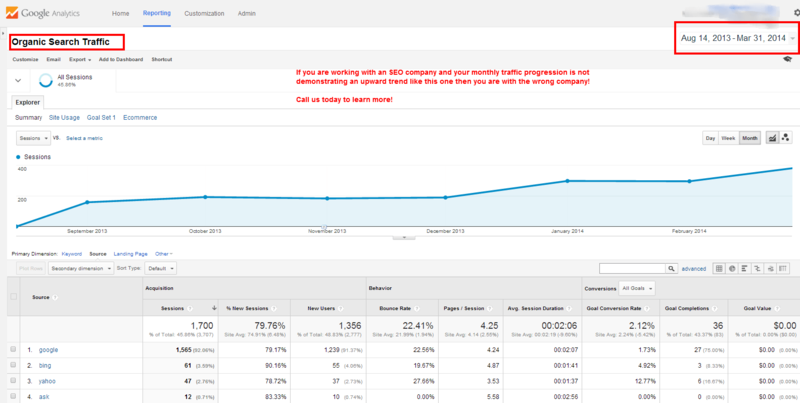 The owner of this website came to us asking to help reverse the effects caused by his prior SEO team. We told him it would not be easy but spelled it all out for him to understand the strategy which involved aggressively engaging in best practices for SEO and social media. As you can see in the recent months, his organic traffic has reached an all time high of 8.2k visitors in the month of January in 2015. If you’re searching for an SEO company that can reverse a Google Penalty you’ve found us! 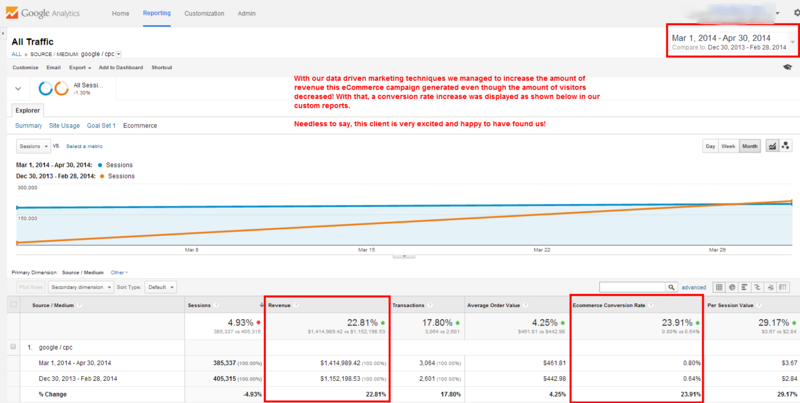 It’s worthy to note that the report below is from one of our clients that has been with us for 3 years and has not suffered from the many algorithm updates including the latest mobile algorithm change that occurred in April of 2015. Their traffic from organic search engines has continued to increase at a staggering rate and they would be happy to provide a testimonial. 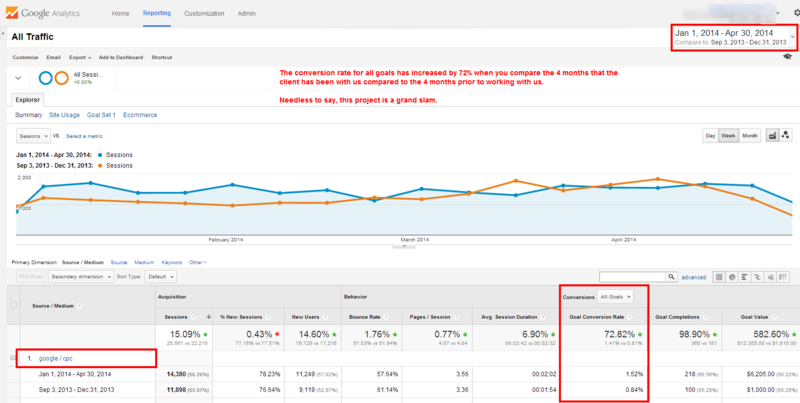 Here another example for those of you who would rather see the results from Google Analytics based on the same client. As you can see organic traffic is sky rocketing and the conversions (phone calls, form submissions and quote requests) are also increasing tremendously! 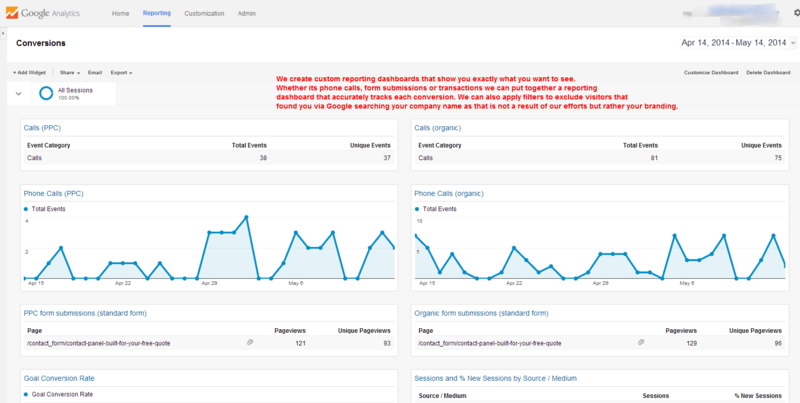 We created a reporting dashboard for our client who sells metal buildings and the dashboard shows phone calls (broken down by PPC and organic traffic) as well as form submissions (also broken down by PPC and Organic visitors). So as you can see below, the client can log into to Google Analytics and see his key performance indicators in real time, 24 hours a day. You can compare date ranges to see the progress made over time. 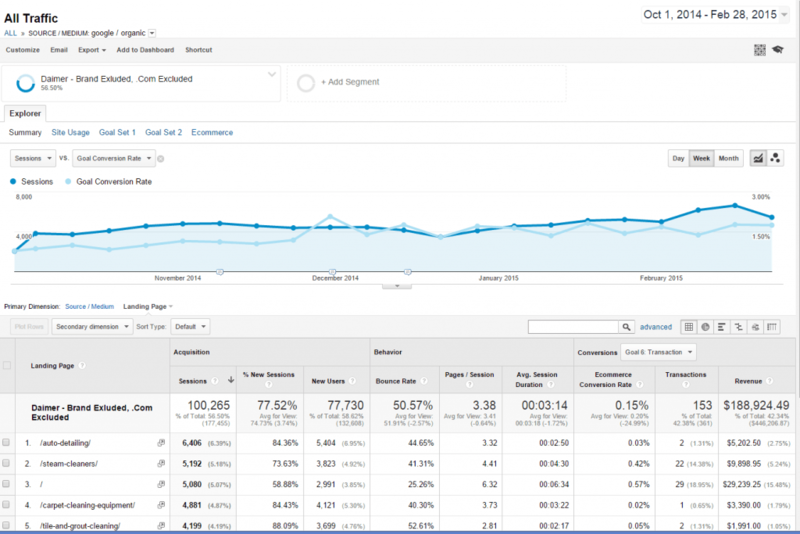 If that’s not enough, how about another game-changing case study from 2015… Below you will find an Analytics traffic report that shows the number of sessions + conversions (phone calls, form submissions AND Transactions) on a linear graph. 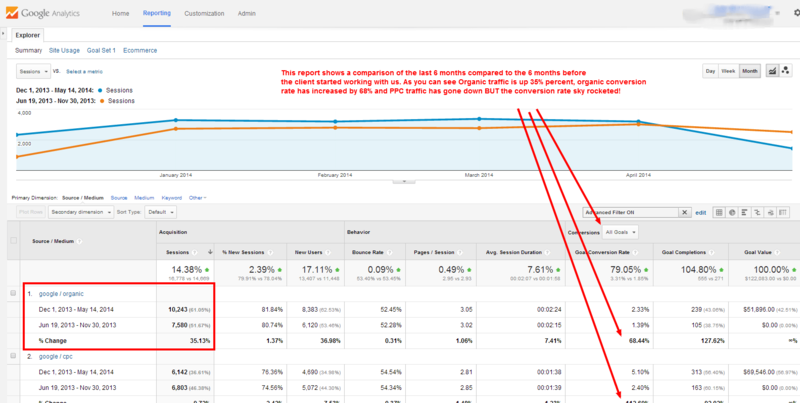 The report is showing only organic traffic from the search engines, all other traffic types of omitted (i.e. direct traffic, ppc traffic and referral traffic). We even went a step further to exclude organic visitors who found them on search engines by searching for their company name or web URL because in theory those are people who already know about the company and are usually not new customers or prospects. Unlike more SEO companies, we like to show reports that are actually accurate and represent REAL results. For a more detailed information on the case studies below, we encourage you to call our office and to schedule a web conference so that we can reveal more data from our successful campaigns. This client signed up about 8 months ago and since then his organic traffic stats are steadily increasing month by month. This has resulted in the client expanding his marketing budget and hiring more staff to keep up with the explosive growth his company is experiencing from our efforts. Needless to say this client is very happy and this project has been a grand slam! This project is current and just started recently, we have already increased the conversion rate significantly for them and they are happier than ever with the performance of their campaign. They are running ads with Google and Bing. The screen shot below shows a very recent data sample in a comparison date range to show the increase in conversion rates and other traffic stats when compared to an equal prior date range. Needless to say the client is very happy with our services. 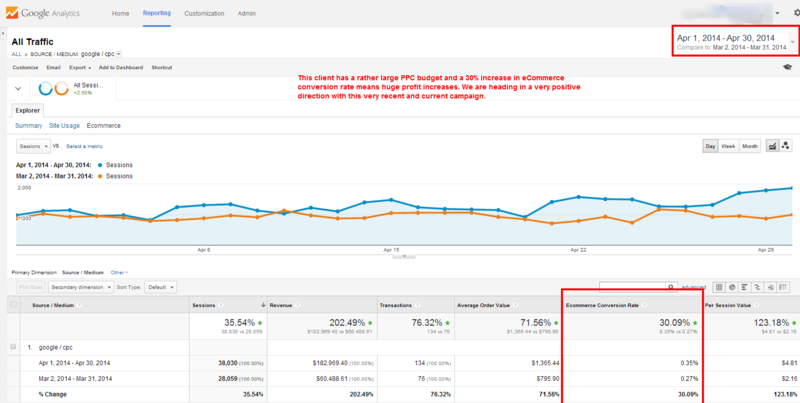 This PPC campaign that we manage has a spend that is over $175,000 per month. We have helped them reach record ROI percentages with our innovative marketing strategies that are 100% data driven. They are running ads on Google and Bing. With our advanced reporting techniques the client can literally track his ROI down to an exact dollar which is crucial for a campaign of this size, each month we continue to increase the ROI which is how we earn our business each month. There are no contracts here, simply results that are worth paying for each month. This client is also doing SEO + PPC management with us and we are experiencing record breaking traffic stats and conversion rates. They are very happy with the results they are constantly increasing their budget due to the high profit margins we are generating for them. 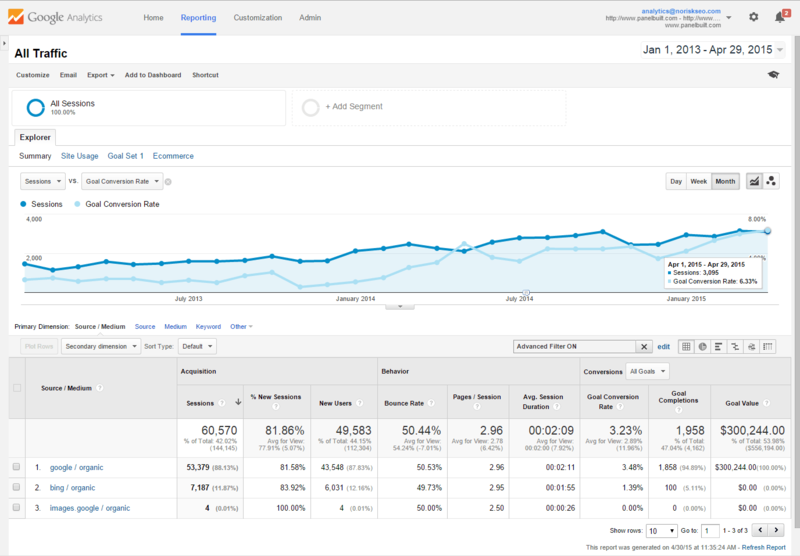 With Google Analytics they are able to log in 24 hours a day to see real time traffic stats and key performance indicators that the client cares about such as number of phone calls and form submissions. Here you will find some of our clients success stories, we use Google Products like Webmaster Tools, Adwords and Analytics to measure the progress of our client’s campaigns. With Google products, we create custom reporting dashboards that show only the data that matters like revenue generation, call volume, form submissions and chat interactions with new users. 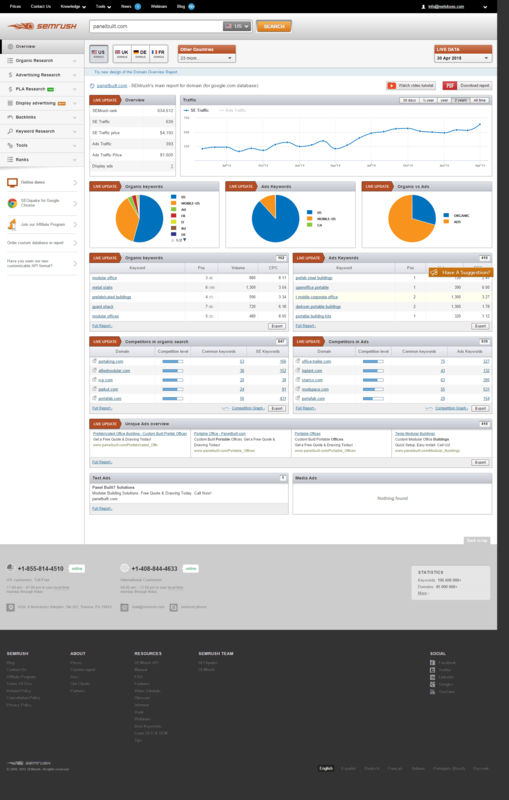 There are other tools out there like SEMRush.com that allow you to analyze a websites SEO positioning very quickly and easily when we’re surveying the market competitors for our clients and prospects. With SEMRush, you can see everything about your competition without having access to their Google Analytics reporting account. Simply enter the URL of the website you wish to evaluate the SEO presence of an “Vua-la”, you have a very easy to digest report showing the keyword that site ranks for (along with the respective ranking position for each keyword) as well as traffic estimates displayed on a linear graph like the one below. As you can see when you use SEMRush to analyze our website, there isn’t another SEO Company in Miami that has better rankings than us. With that being said, let’s get into the success that we provide our clients. While it may seem like we’re bragging about this, you would be surprised to know that over 50% of our prospects come to us because they’re unhappy working with another SEO company that has no organic exposure for themselves. We take pride in being able to rank on page one of Google for really tough keywords to the point where our traffic is valued at over $40,000 per month (based on current cost’s per click using the same keywords that we rank for organically). Medical Equipment eCommerce SEO Grand Slam Case Study! In the first quarter of 2015, we launched a brand new website with a brand new domain and the results today are INCREDIBLE. This client at first started as a one man show and now has several sales reps, technicians and has strengthened his relationship with manufacturers so much that they are providing him with the lowest prices for wholesalers. The website’s organic traffic has consistently increased each month to the point where competitors who have been in the business are offering to acquire his company and web assets to get him out of the industry. They rank for almost all product names and for keywords related to their product categories on a national scale which means they’re getting traffic from all over the US. 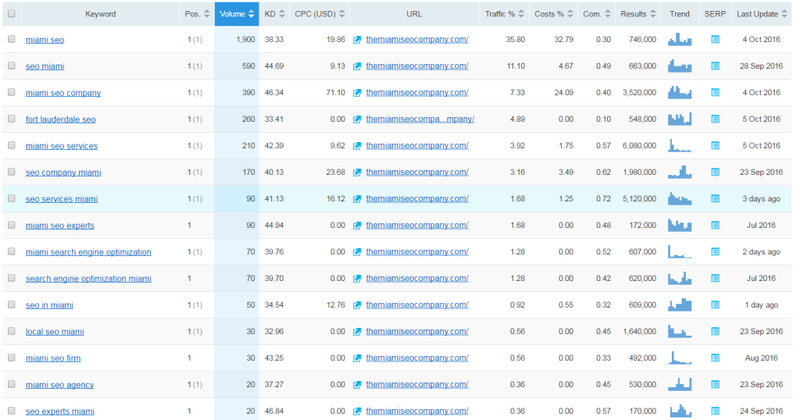 Some of the keywords that they’re ranking for can be seen using SEMRush.com. 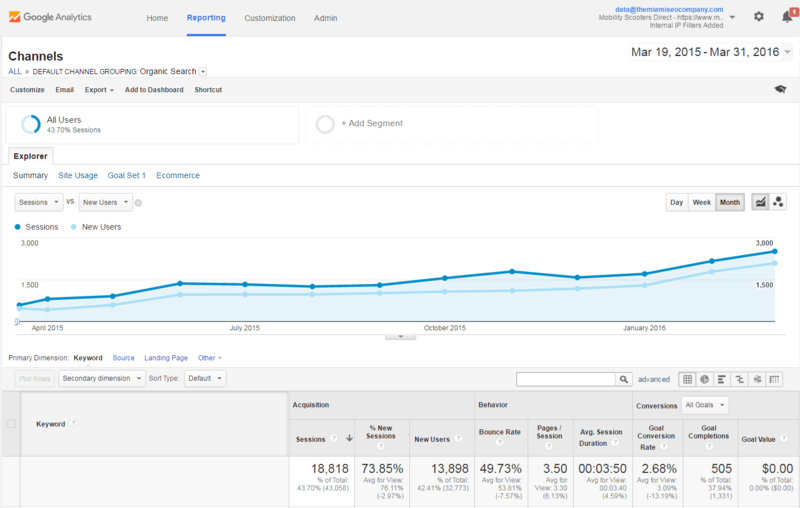 Below is an Organic traffic report from their Google Analytics account (on the graph you’ll see organic visitors in dark blue & new organic visitors in light blue) , more information is available on the Mobility Scooters Direct case study when you call for a free consultation.